Today, I want to discuss how you can measure your quilt using the UNIQUE longarm zero center tape measure. 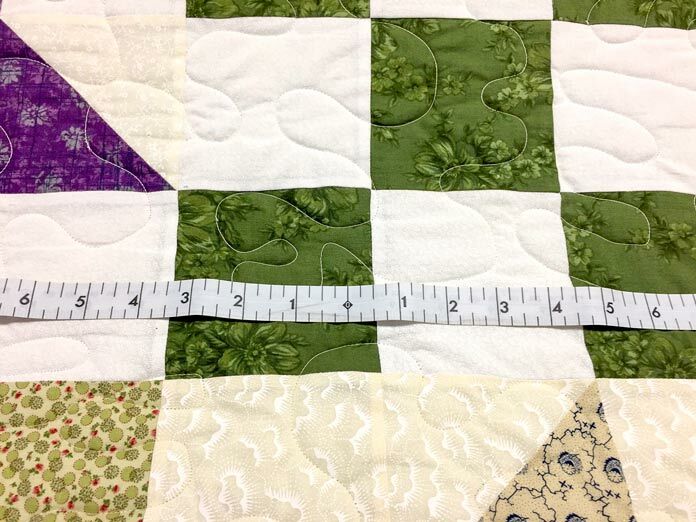 When I first started quilting, I found that the traditional/old school measuring tapes were not great because you couldn’t measure a 110” x 110” king size quilt with a traditional tape measure. I’m happy to share that UNIQUE longarm has measuring tape that can measure a quilt up to 120”! The manufactures and suppliers now know quilt dimensions and what quilters’ want. We all asked and they listened. This is awesome! It starts with zero in the center and measures 60″ out from the center of your quilt making it very easy to use. Before I begin, see my earlier posts this week when I went over other UNIQUE longarm quilting tools that can also be used when quilting with domestic machines. UNIQUE longarm zero center tape measures 60″ out from the center on both sides of the tape making it easy to measure a quilt width or length. Side two end of UNIQUE longarm zero center measuring tape, shows 60″ at both ends and zero in the center along with one inch and ¼” increments. This tape measure was developed with longarm quilter in mind. This double-sided vinyl coated tape measures 120″ in length. Side one features inches with 1/16″ with increments on one edge and metric on the other edge. Side two is a centering tape measure: zero at the center; left and right of center features 0″ to 60″ with 1⁄4″ increments. Although developed for longarmers, it is also very useful for domestic quilting work as experienced quilters can well imagine. Quilters have been wanting this tape measure for quite some time. Side one of the UNIQUE longarm zero center measuring tape showing inches and 1/16″ increments and metric on the other side. Honestly, I have had my husband borrow it from time to time when he is working on his handy projects. I recommend you keep this tape measure a secret (along with your fabric scissors), so that you can enjoy its features and be able to measure your quilts when you need to. Another fantastic tool… the UNIQUE longarm quilters’ dust brush, where have you been all my life? Why didn’t I invent you? 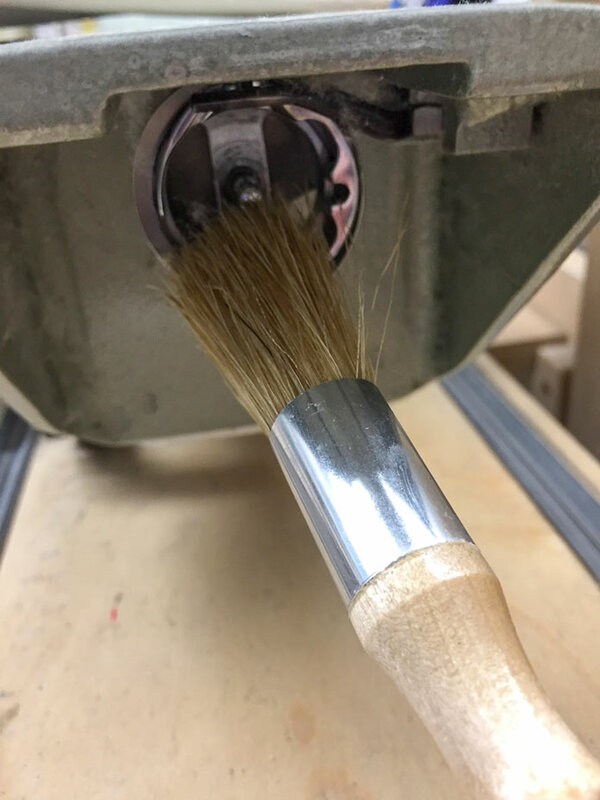 This quilters’ dust brush has a thick brush on it and it’s longer than the ones that come with a sit-down sewing machine, making it perfect for the longarm machine. This brush is great for cleaning dust and fibers out of grooves. It picks up more dust all at once because the brush is wider, making dusting quick and easy. The long handle also makes it easy to get into tight spots that are tough to reach. The brush measures 5⅝” long. When you’re working on a quilt with 2 layers of fabric and a layer of batting, the constant stitching and disturbing of fibers creates a whole lot of dust and this dust brush is a legitimate cleanup tool for this type of dust. Lots of lint gets on my longarm machine and particularly down by the wheels and on the travel trolley of my machine and this lint brush is awesome for tidying up the lint. It’s also helpful to reach under my machine to clean out the bobbin case area. With a longarm having a longer throat, there just is more surface area to collect dust and cause problems with tension, hook system rotation, threads etc., this tool is essential. The bristles on it are fairly soft and won’t scratch your machine. 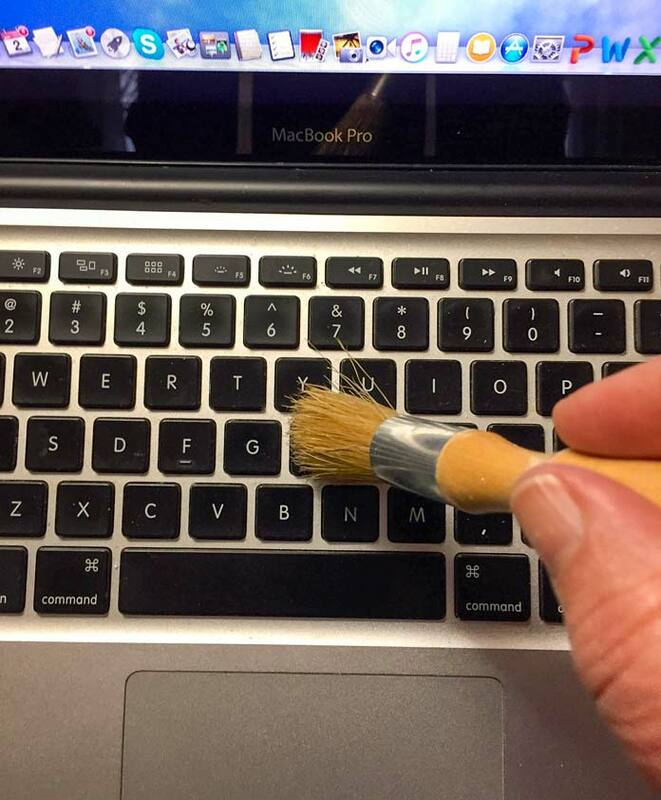 Another great use…use it to clean out between the keys on your laptop works great there as well. Using my UNIQUE longarm quilters’ dust brush to clean between the keys of my laptop. Where to get these cool tools for longarm quilters? Check your local quilting and sewing shops and ask them to stock them. Join me tomorrow when I discuss the final two exciting essential longarm tools including: UNIQUE longarm Pattern Tracing Film and UNIQUE longarm Film Marking Pencils.